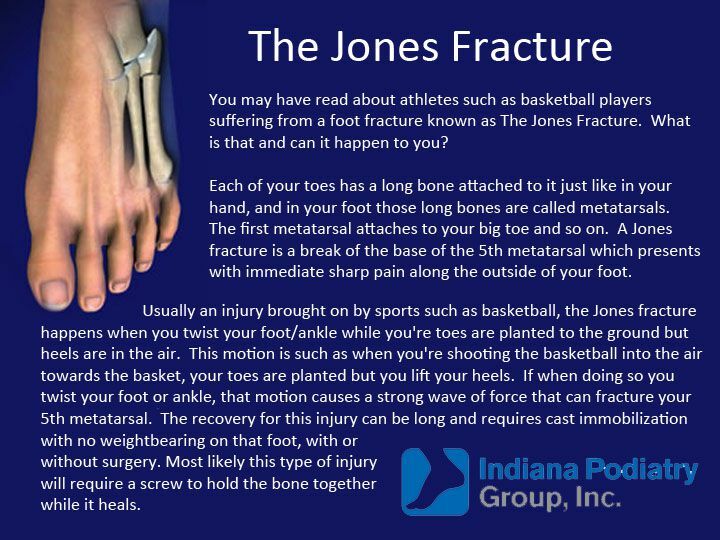 You may have read about athletes such as basketball players suffering from a foot fracture known as The Jones Fracture. What is that and can it happen to you? Each of your toes has a long bone attached to it just like in your hand, and in your foot those long bones are called metatarsals. The first metatarsal attaches to your big toe and so on. A Jones fracture is a break of the base of the 5th metatarsal which presents with immediate sharp pain along the outside of your foot. Usually an injury brought on by sports such as basketball, the Jones fracture happens when you twist your foot/ankle while you're toes are planted to the ground but heels are in the air. This motion is such as when you're shooting the basketball into the air towards the basket, your toes are planted but you lift your heels. If when doing so you twist your foot or ankle, that motion causes a strong wave of force that can fracture your 5th metatarsal. The recovery for this injury can be long and requires cast immobilization with no weightbearing on that foot, with or without surgery. Most likely this type of injury will require a screw to hold the bone together while it heals.